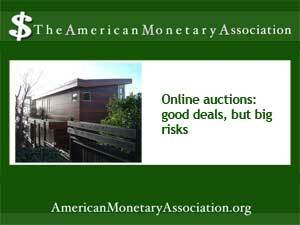 Can Online Auctions Boost the Recovery? “Going, going, gone!” And the gavel slams down. If that’s your image of an auction sale, think again. Although “real world” auctions are still around, letting people bid on everything from livestock to acreage, auction sales have gone online in a big way. And because pnline real estate auctions offer a quick and no-frills way for lenders to dispose of distressed properties, the rapid spread of online auction companies my have a lasting impact on the housing recovery. Online auctions conducted by reputable auction companies work in ways similar to physical auctions – bidders have the option to place a bid on a property from anywhere. Posted prices to start the bidding can sometimes be laughably low – a few thousand dollars for a large home with acreage, in some cases. The highest bid at the close of the auction window gets the home. Transaction fees are handled through the auction house and deeds and other documents are transferred to the new owner once those fees are paid. Auctions typically expect buyers to produce cash, or to be able to arrange financing with a cash down payment that’s held in escrow during the bidding process. It sounds like an easy, fast way to buy investment properties – and to make investment dollars stretch. But some caveats apply. Although houses go up for auction for a variety of reasons, the majority of properties sold at auction are distressed properties, primary foreclosures that didn’t sell in the standard real estate market. Homes sold at auction are typically “as-is.” That means the buyer accepts whatever flaws the property has, with no recourse, although there’s generally a grace period of a few weeks to allow a buyer to back out of the deal. Real estate professionals advise prospective buyers to conduct careful inspections where possible before placing a bid. Because most houses on auction are foreclosures or other kinds of orphan properties, there’s usually no owner involved. Financial and title institutions take care of the transaction. Once a buyer wins the bid and pays the money, they receive the keys and the deed, and the deal is done. If you’re considering trying an online auction, real estate experts stress that it’s essential to do a lot of homework. Before putting any money down for a bid, check the auction company’s reputation and track record. Investigate any financial entities associated with the purchase, such as lending and title institutions. Investigate the property thoroughly, too. Photographs and descriptions posted on the auction site aren’t enough to accurately show the actual state of the home. If you’re bidding on a property that’s not in your local area, try to arrange for an inspection or visit the place yourself. Tally up all fees and expenses before you bid, too. In addition to the bid price and the usual closing costs, auction houses may assess their own fees as well. Make sure you understand the procedures for handling the return of escrowed funds if you don’t make the winning bid. Will Rising Interest Rates Slow the Recovery? No End in Sight for Bank Settlements?